Cake decorating is one of my passions but I fully understand that not everyone derives joy from baking and creating lovely cakes. If I were to be perfectly honest, I don’t always bake my own cakes. Sometimes, I’ll use a cake that I find at my local supermarket. Why? Because all that time in the kitchen takes away from other things and often I’m in a rush and just really need to grab something quick. But, that doesn’t mean that I don’t want it to look beautiful. 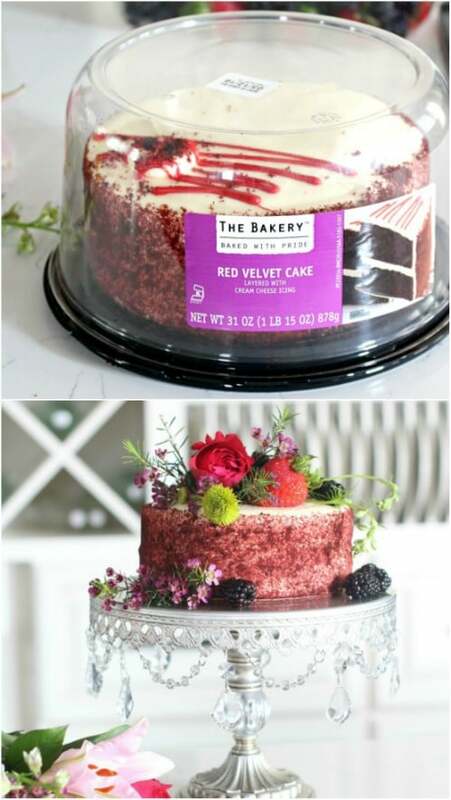 And, this is why I’m sharing with you these 15 wonderful ways to turn an ordinary grocery store cake into a work of art. I want you to experience the joy of making beautiful cakes – without all the effort. You can take a plain white cake and make a spectacular wedding cake or turn it into an amazing birthday cake that goes right along with your chosen birthday party theme. Depending on the price of your cake, you’ll spend very little making these little masterpieces, which is a steal compared to around $50 or more for a custom cake from a bakery. 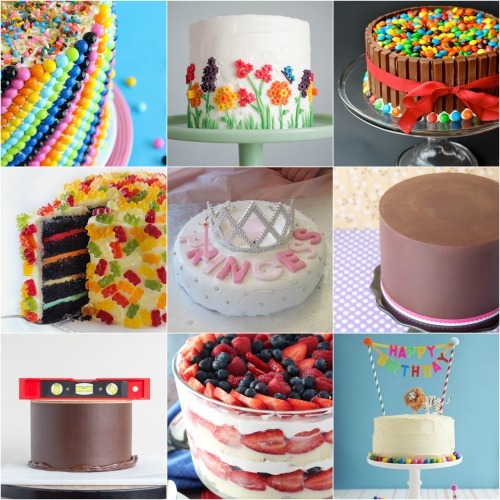 Whether you need a cake for a child’s birthday or you’re planning a simple wedding and want to do your own cake, you’re going to find some amazing ideas in here. Plus, if you are planning a wedding, be sure to check out these 35 breathtaking DIY rustic wedding decorations. I really do love cake and I love that you can take a seemingly ordinary cake and turn it into something spectacular. 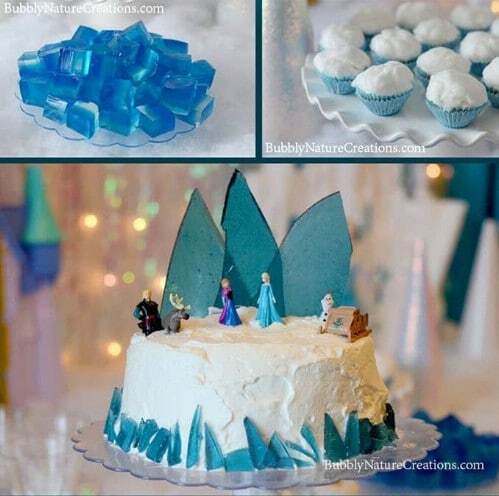 From character themed cakes to the perfect summer cake complete with fresh fruit, I’m sure you are going to love these cake ideas as much as I do. All of them are super easy to create and you don’t have to be anywhere near a professional cake decorator to make them. You can be someone who has literally never decorated a cake or cupcake in your life and still pull these off! And, you can also create this amazing Easter Bunny cake if you feel like improving on your cake decorating skills. You really don’t have to spend a fortune at the bakery to get a cake that looks like it was professionally decorated. These grocery store cake hacks are perfect for anyone who wants to save a bit of time and money and get a cake that is sure to impress everyone at your next event. Something as simple as adding fresh fruit can instantly dress up that plain store bought cake and make it spectacular. You don’t even need that much fruit or that much time for this one. Just choose your fruit – strawberries, bananas, kiwi, etc. – and then layer it in whatever design you want. 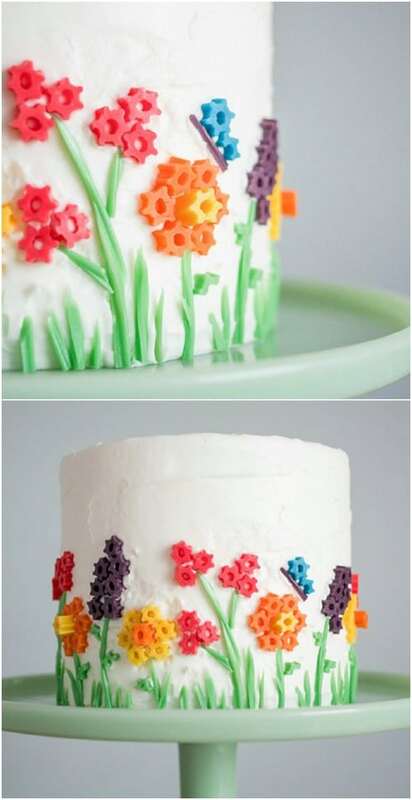 This is an excellent idea for summer parties and barbecues or you could use flowers as well to give that grocery store cake a makeover. If you’re planning a child’s birthday party and you need a decorated cake in a snap, just add gummy bears! Kids adore gummy bears and they’re the perfect decoration for cakes because they’re edible. 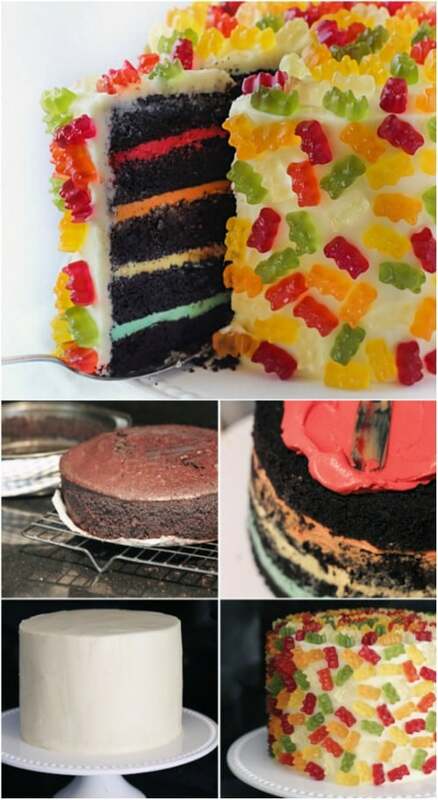 Just layer them in whatever design you prefer and you have a fun and colorful cake. This can be done with any grocery store cake, even one that has decorations – you can just cover those over with gummy bears! I love this carnival cake that you can easily make from a plain grocery store cake. You’ll need alphabet letters, pipe cleaners, pom poms, skewers and a few other supplies to create the banner and then you just fill in other areas with brightly colored M&Ms, gumballs or whatever you want for decorations. Circus peanuts are perfect for this, as well. If you’re planning a carnival party, this is the cake for you. I love ganache! It’s so beautiful when it’s done and you can do so much with it, including covering a grocery store cake with it to make it spectacular. If you’ve never worked with ganache, you’re in for a nice surprise. 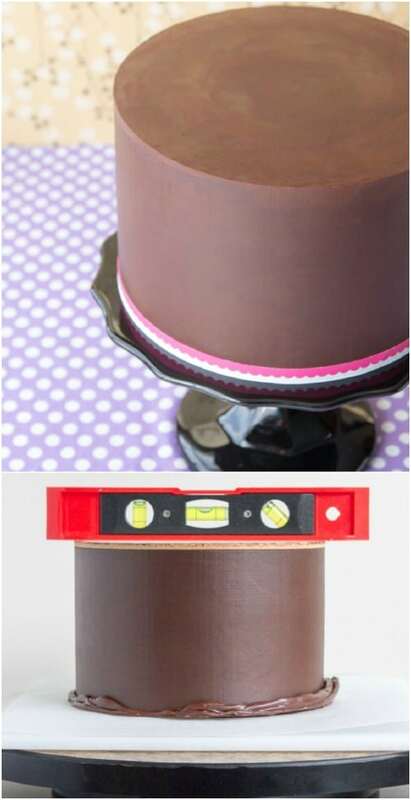 It’s easy to make and even easier to decorate with and you can add so many wonderful elements to the top of your cake when you cover the sides in ganache. Top it off with fruit, whipped cream, or any number of other decorative items. 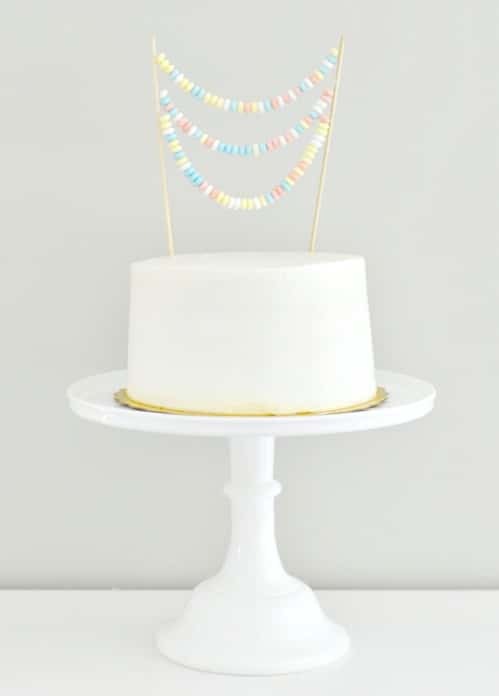 Candy necklaces are really cheap – you can get several for a dollar at most Dollar Stores or Dollar Tree stores – and you can use them to create a lovely banner for your plain grocery store cake. 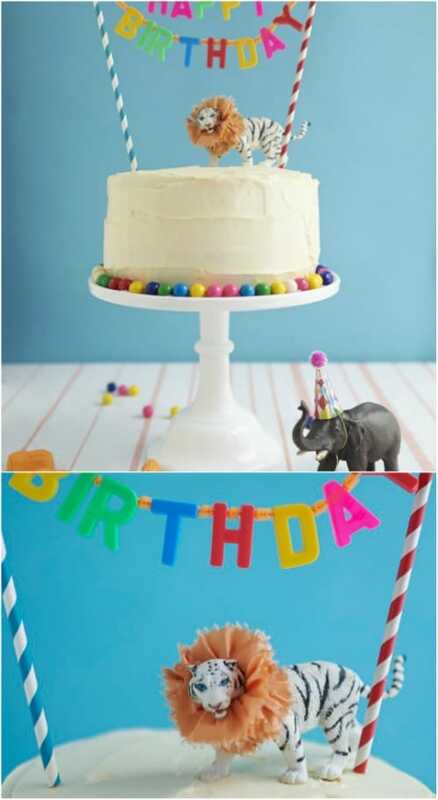 Whatever icing color your cake has, this little colorful candy banner is sure to give it a whole new look. You could even (carefully) take the necklaces apart and use the candies to decorate around the outside of the cake for even more decoration. I love this candy covered cake – and your guests are going to love it, too. To make it, you just take an ordinary grocery store cake and literally cover it in candy. 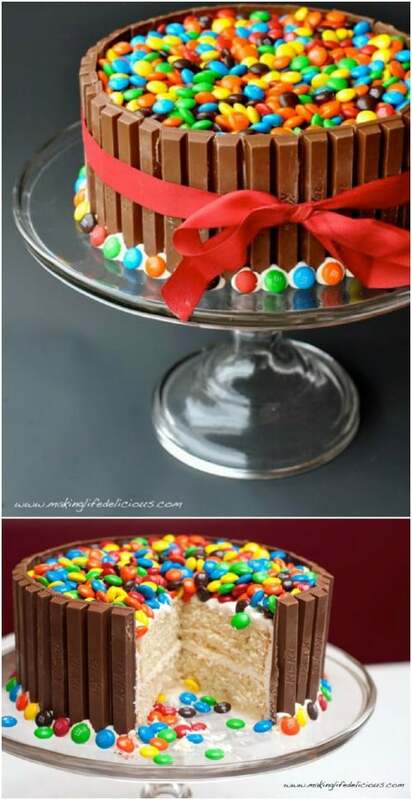 Use Kit Kat bars to cover the outside of the cake and then M&Ms to create a colorful top and border. This is so very easy and you can have it completed in less than 20 minutes. If you’re in a pinch and need a spectacular cake, this is definitely the one to make. If you’re planning a princess party and you don’t want to spend $50 or more for a custom cake, this princess tiara cake is perfect. 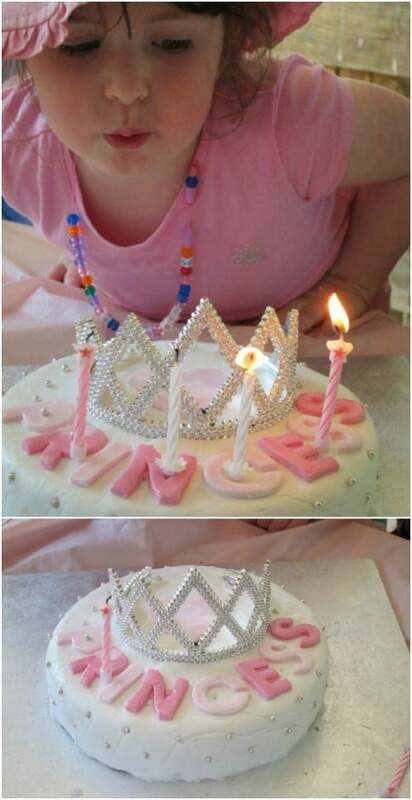 You just take that ordinary store bought cake and add a tiara – that you can buy at the Dollar Store for around a dollar or so. Add in some piped in color or cut out your little princess’ name from fondant and it’s completely customized and not nearly as expensive as you would expect. You can make this entire thing for less than $10 – not counting the cake. Turn that ordinary cake into a colorful work of art with Twizzlers. Twizzler flowers are so easy to make! They’re already shaped – you just have to cut them apart and then add them to the sides of your cake to create a dessert that is perfect for birthday parties or general get-togethers. This is one of the easiest grocery store cake hacks and one of the most spectacular – not to mention one of the cheapest. 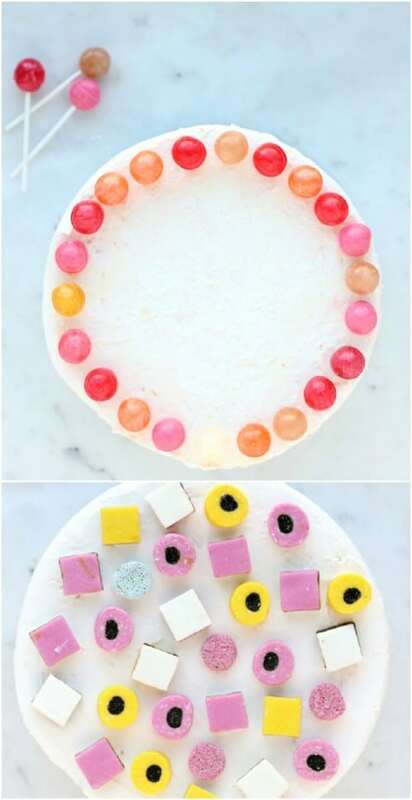 This confetti cake is made with Sixlets and confetti and it’s super easy. 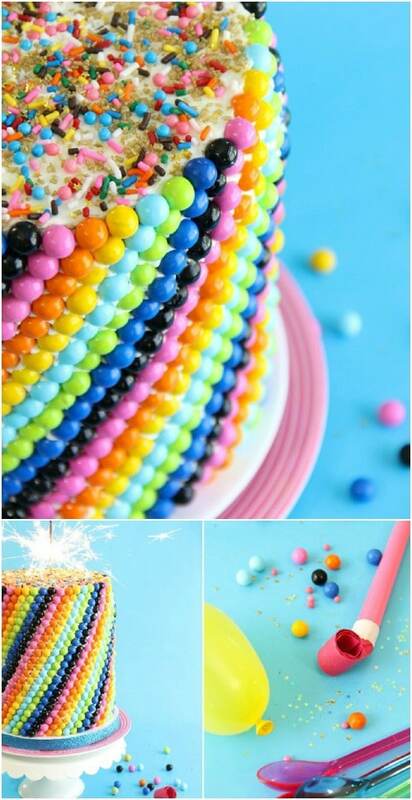 Take that store bought cake and simply cover it in Sixlets. Create a pattern or design or just put them on in random designs and then cover the top with any number of confetti type sprinkles. You could also use colored M&Ms or Skittles. Candy corn would be great for decorating a Halloween cake or you can use jelly beans for springtime. There’s no rule that says that grocery store cake has to stay intact. 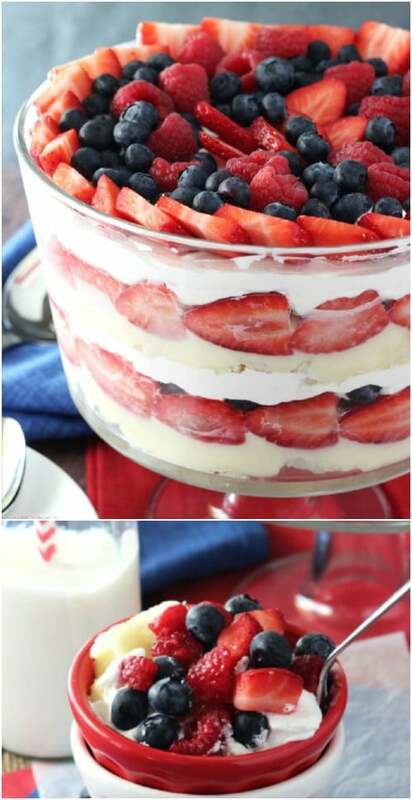 You can totally use it to layer a brilliant dessert with this berry trifle. Trifles are easy to make and of course, delicious. You’ll need fruit and pudding in whatever flavor you want – cheesecake or French vanilla work really well. Strawberries, blueberries and other fruits can be used and you can use any number of cake flavors depending on your fruit choice – and what your grocery store may have on sale. Adding a simple cake topper will transform an ordinary cake into something that’s perfect for any celebration. You can easily make this pom pom cake topper with just a few craft supplies that you may already have on hand. Just bend pipe cleaners into the words that you want to create and then hot glue your pom poms on. Then, add the topper to your grocery store cake to dress it up. Did you know that you can turn an ordinary grocery store sheet cake into a beautiful wedding cake? And, you can save yourself some major money when you do so. You’ll spend less than $50 on this and that’s including the cake. All it takes it a little rearranging of the decorations and maybe a nice ribbon border and some fresh flowers. 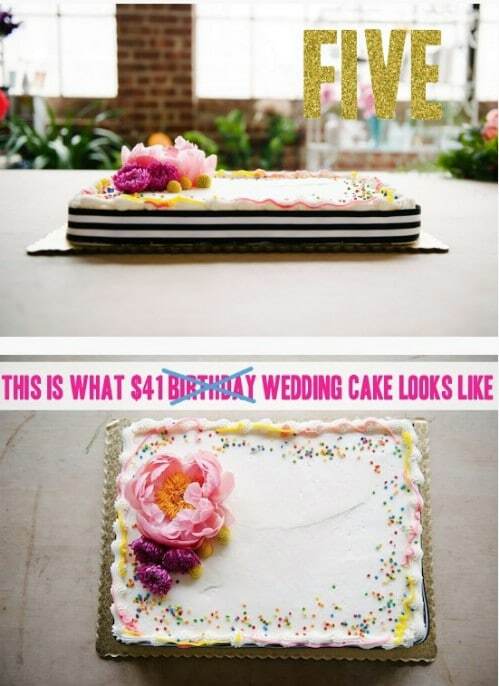 If you’re planning a small wedding and don’t need a huge cake, this is a major money – not to mention time – saver. Some colorful lollipops will turn that plain cake into something amazing. And, lollipops are really inexpensive so this is perfect if you’re party planning on a budget. 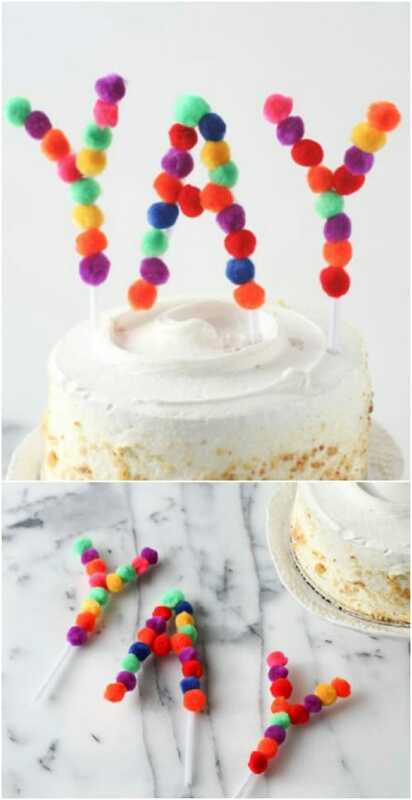 Just unwrap your lollipops and use them to create a colorful border on your grocery store cake. You could also add sprinkles if you want but the lollipops do a great job of adding color and design on their own. If you’re planning a themed birthday party for a little one and you don’t want to spend $50 or more on a custom cake – or you don’t have time to wait for said custom cake – you can create an amazing party cake by just adding toys to the top of a store bought cake. Just choose the toys that you want and create your own themed cake. This literally will only take you about 10 minutes and if you already have the toys, it won’t cost you anything extra. You don’t have to be a professional cake decorator to get a cake with a message and you don’t have to custom order one, either. 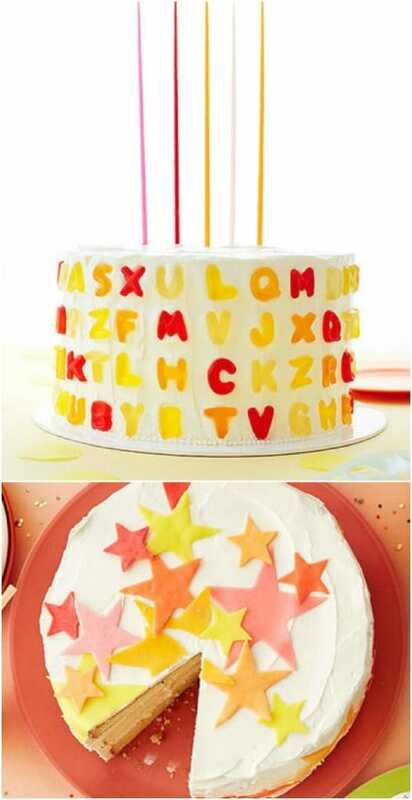 You can turn an ordinary store bought cake into a great message cake with gummy letters. Just press the letters into the icing on the cake and you’re all set. This would be a great toddler’s cake – you could literally cover the entire cake in ABC’s or spell out a really special message for your little one. Awesome ideas. Kiddos will surely love the M&M’s and Gummy bear designs.